It’s essential in Girls Frontline to level T-dolls in your Echelon in order to progress further down the storyline. Depending on the level, T-dolls will get access to additional links and increased number of gears and quality of those gears. Additionally, the difficulty curve of the storyline’s enemy combat power increases as you move on to later area. 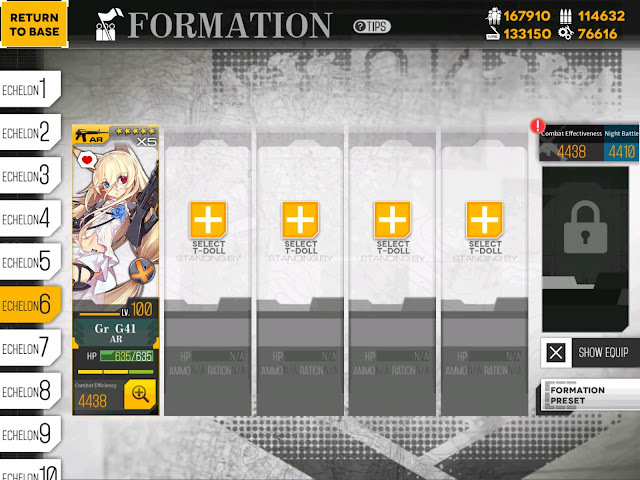 So if you are looking to smooth sail through missions, your 1st echelon should at least be 4x links and 80 levels. However if you are looking to invest your time into leveling T-dolls you would be also spending increasing amount of resources as T-dolls gets stronger, especially ammo and food. If you have 4 echelons to spare and opened up later area such as area 0 and area 5, Logistics Supports missions can help minimize the drain but even it will hit its limit if you are looking for power leveling in short period of time. 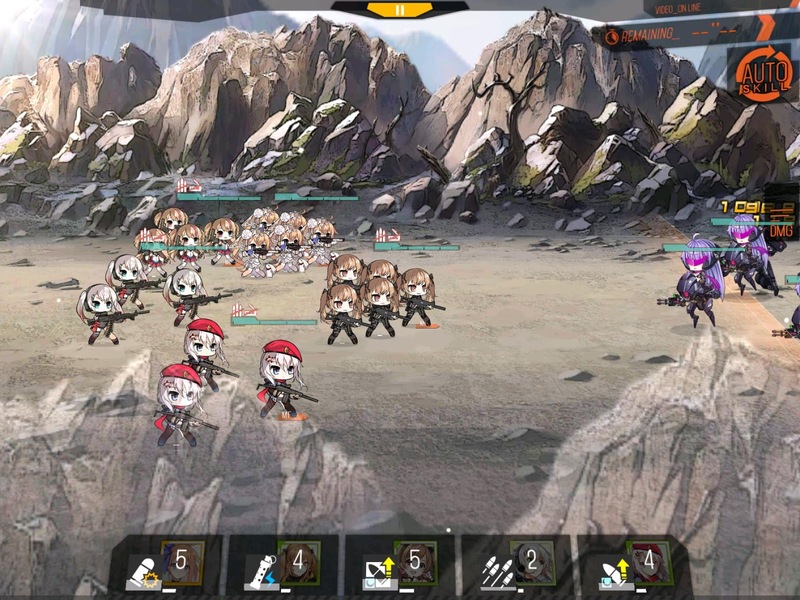 If you have raised your first sets of T-dolls to certain level and links, you can use single doll to do the entire battle for the squad and other doll to tank the entire battle do share experiences with rest of the echelon. There are many names for it but it seems in EN server it’s called the “Corpse drag” run. Personally, I call it the “Frugal run” because you are minimizing the resource usage by being frugal. So just think that those are one and the same for now. Let’s look at the basic setup to see how to execute a Frugal run. First you want to disable automatic resupply option in the settings. I also turn off the Skill cut-in animations because it adds lot of time for each battle. So if we are looking for an efficient run, might as well save some time as well! 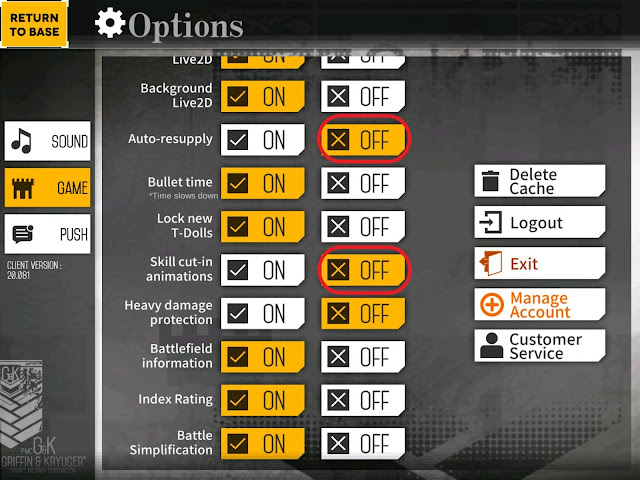 Turning off auto-resupply is so that we can control who gets the ammo in the echelon. Ty2012 from reddit pointed out the “Heavy Damage Protection” option was off on my setting [Thank you!]. This is not recommended for the beginners who are just getting started as this option protects your doll from death, which drops affection meter by 10 and other dolls in echelon by 5. Affection meter is important that it gives stat buffs once it hits 90. For experienced players who are looking to squeeze few more runs out of the tanker who is already damaged, it can be quite frustrating to see your tanker retreat automatically mid route and watching your dolls in the back line get hurt. That’s main reason I have it off in this setting, but my recommendation is always on for regular play. 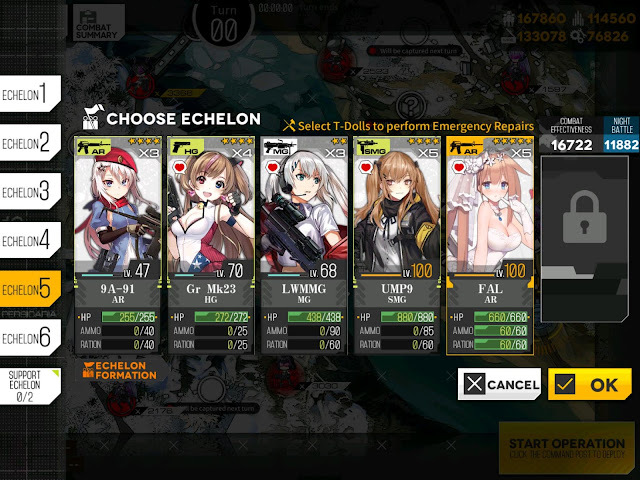 Next, let’s look at the Echelon Setups.We will be using 2 echelon slots for the purpose of frugal run. 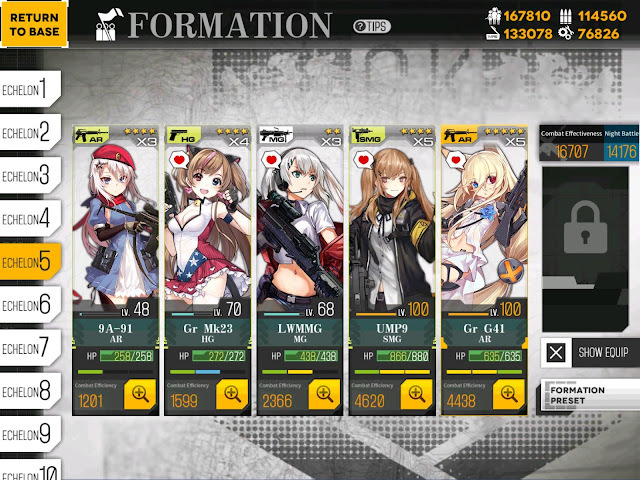 1st being the main echelon with damage dealer, tank, and 3 “passenger” dolls that will gain experience from the battles but not actively participating in the battle. I’m using an analogy of bus to describe the echelon, which is a popular way to describe it in korea, and bit of a meme there. I like putting passengers on the leader slot because MVP is always going to be taken by the driver. Then you can at least give bonus exp gained for leader to passengers. For the formation of the “Bus”, it is free flowing but you just want to follow the basic guide. 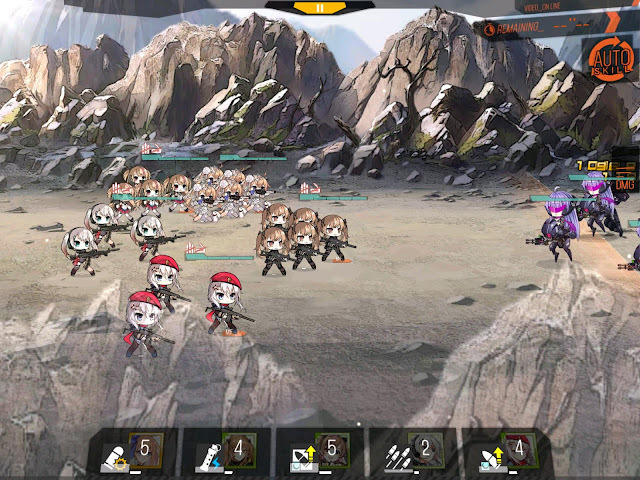 Tanker on the front, and dolls providing tile bonus to respective dolls. Even if passengers can’t participate in the battle, they still provide buff for the DPS. So prioritize giving buff to the dealer, in my case FAL. FAL and 9A-91 is providing buff to UMP9. The Driver, or main DPS of the team, will be the only doll that will get supplies to fight. But how do you do that? Well we achieve that by using second Echelon. On 2nd Echelon, you are putting your second DPS doll or other driver. You want them to be well leveled, well linked and well equipped. Better their DPS, less tankers have to heal frequently. Okay so we have the basic set up done. Now let’s put them into practice. 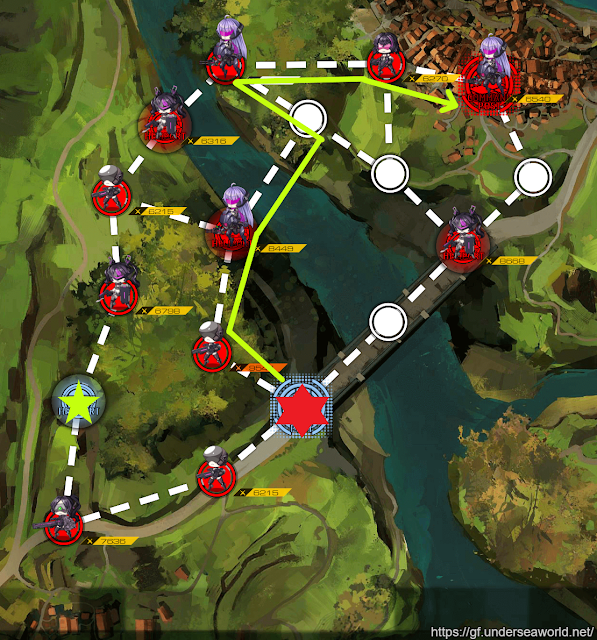 For demonstration, we are going to use the popular leveling spot, 4-3E. Red star is where Bus is going to be departing for our leveling run. For green star, that’s where our second DPS doll will drop to resupply for the next run. One thing you want to do before getting started is making sure that your driver of the bus is fully stocked before being added to the bus. 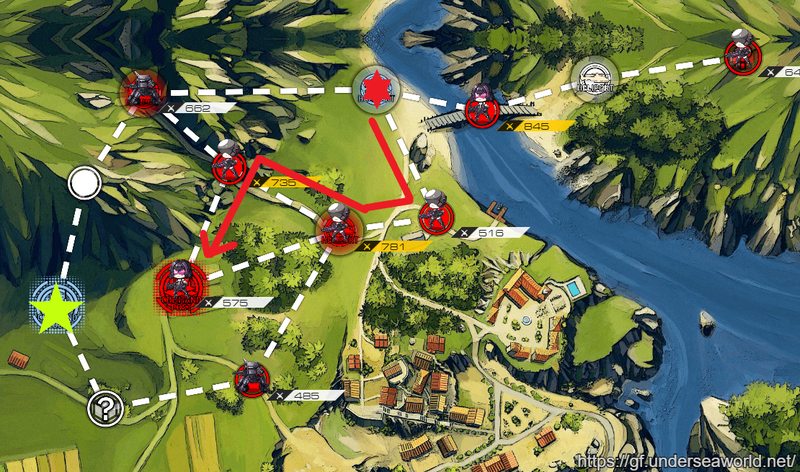 You can do this by going to a map with a driver, and another echelon with a HG in it [or known as Dummy Echelon]. Resupply and retreat from helipad, then retreat. Confirm that DPS is the only one in the echelon with supplies before deploying. 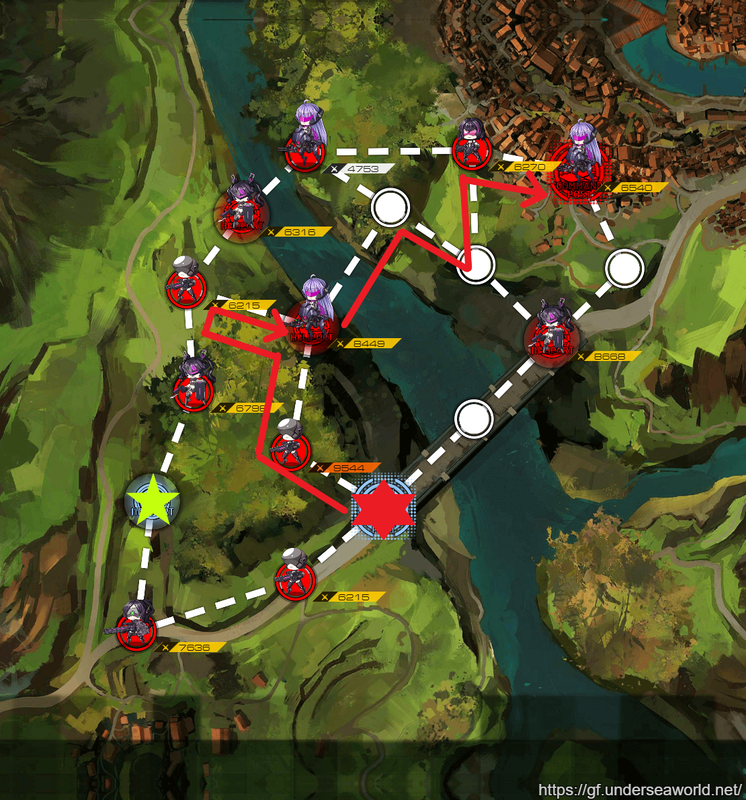 In the beginning of the turn, make sure your Driver echelon on the HQ node is fully supplied before going for the battles. For 4-3E, there is just enough Action Points to get to HQ and end mission in 1 turn. 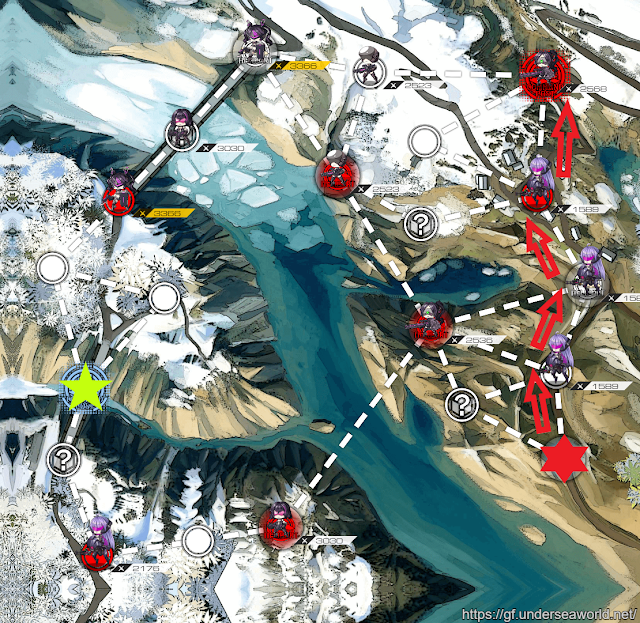 Plus enemies on the way are relatively low strength, which makes it an ideal map for exp grind. Once you are done with mission, just switch the Driver. That’s it. Simple and efficient. Now that we have basic understanding of Frugal run [A.K.A. Corpse Drag Run], now let’s look at efficient leveling locations. 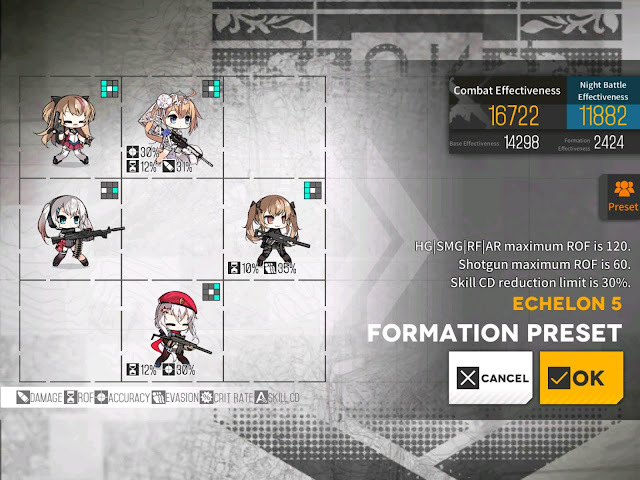 As you know, maps in the Girls Frontline have exp caps based on T-doll levels. If dolls go beyond the level cap, dolls will receive reduced exp from the battle. So it is important to know when it happens and minimize exp loss. So let’s look at these maps. Thank you to Blackkat101 from Reddit who pointed out that while there is a cap for the maximum level, there is no minimum level floor for the Frugal Run. So you can still take few dolls at level 1 in 0-2 with no issue. Following list of maps are mainly for starters who are looking to level their entire echelon together for first time, but last few maps [4-3E, 0-2 and 0-4] are still popular frugal run spots.If you are looking to level entire echelon, instead of driver echelon, use a dummy echelon with 1 HG on green star. For Frugal run participants, just like example from above, I’m using red star and green star for the starting location for the bus and the driver resupply point. 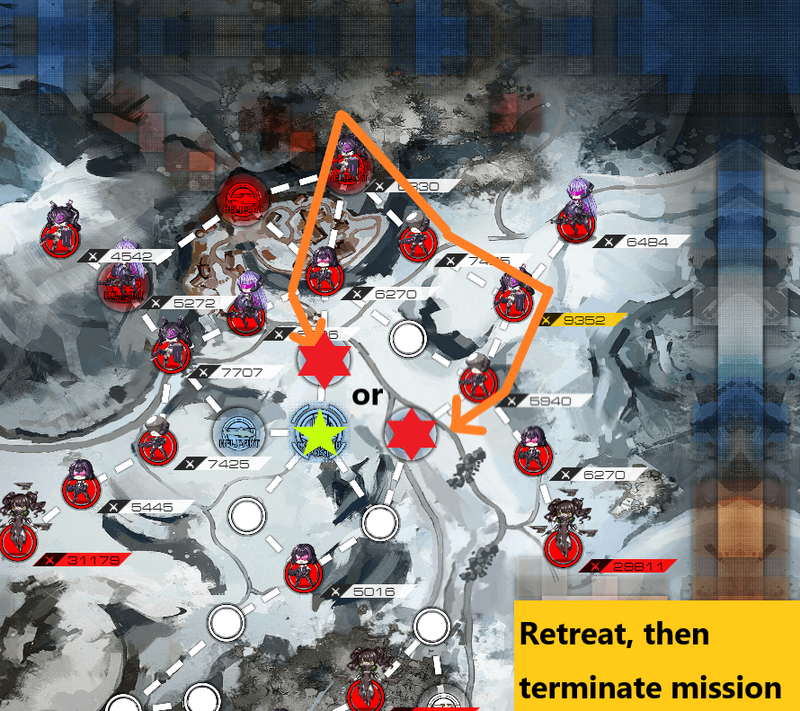 I personally don’t recommend this one since you can do far more efficiently via auto mission run of 1-2. But if you already sent auto battle to somewhere else, this would be a way to do it. There is actually multiple ways to get to the HQ, while still taking out 4 enemies in the way. Looks same as map before? because it is! Just higher enemy combat power. Enough already said about this map. You will see lot of this map… a lot. 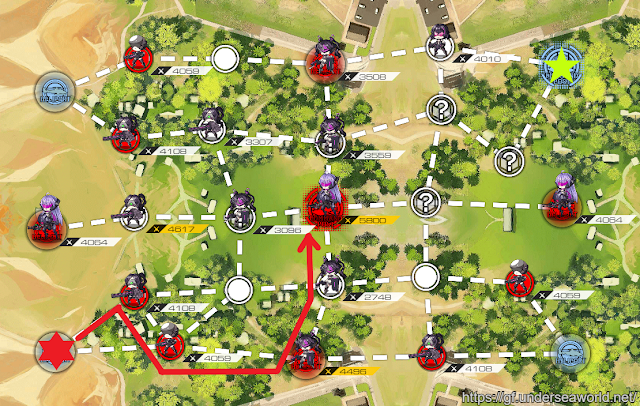 This map is great for raising RF echelon once it hits 80 and gains the additional dodge and camo cape for the RF. same cannot be said for the AR echelon. 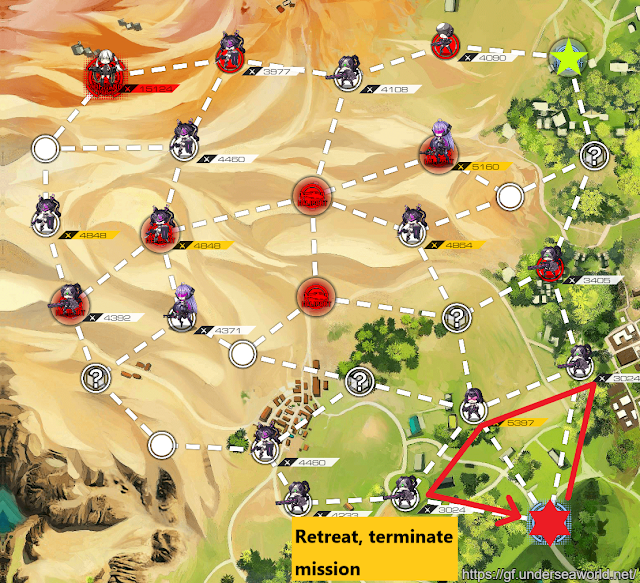 This is the one of the maps where you don’t clear the mission at the end but instead retreat. This is actually a good way to get mission fail achievement. For non dragging purpose, just put dumy HG on top helipad, take out bottom 3 enemy units surrounding HQ, then retreat after moving back on to HQ. 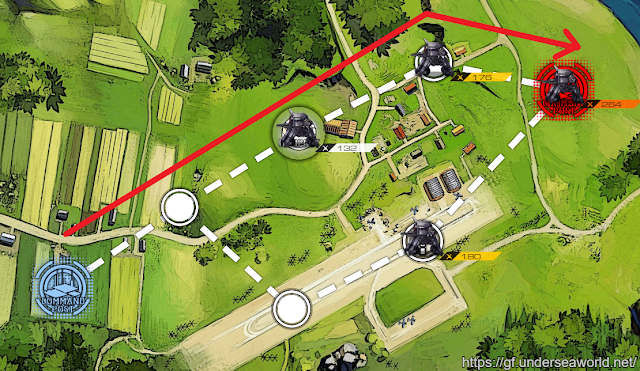 If you are looking to drag this map, you just take out 3rd echelon that is single HG near HQ and retreat while resupplying the Driver from helipad above. Make sure you spawn a Dummy Echelon on HQ pad as your 4th move, Swap with the “Bus” and retreat both driver and “Bus” Echelon. Thank you Sora-kun from reddit for pointing that out. 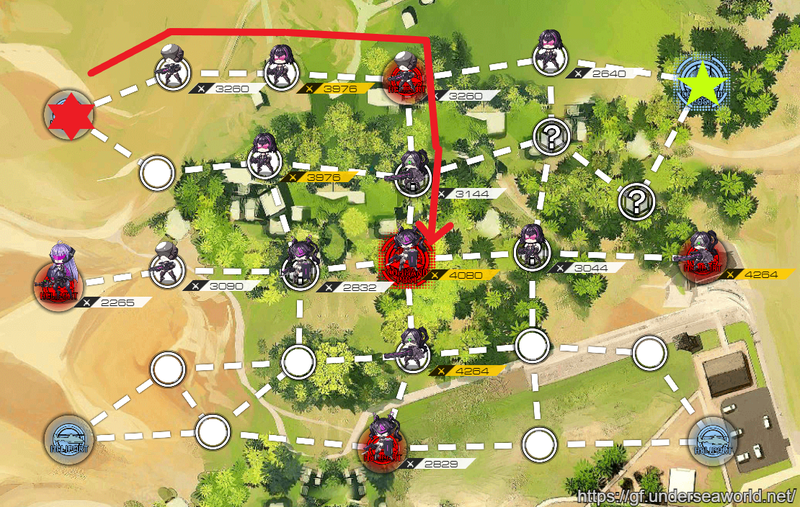 This is another popular route that also only takes 2 turns to finish and take on unit that has extra chance to drop 4-star T-dolls. 07/02/18 Edit: For 0-2 there are many routes you can take if you have other goals in mind such as aiming for additional cores or further minimizing damage while under prepared for the map. In the near future I will go over them in detail with new dolls added. Great map for last few levels to hit that 100 for the Dolls and not a bad drop rate for cores. 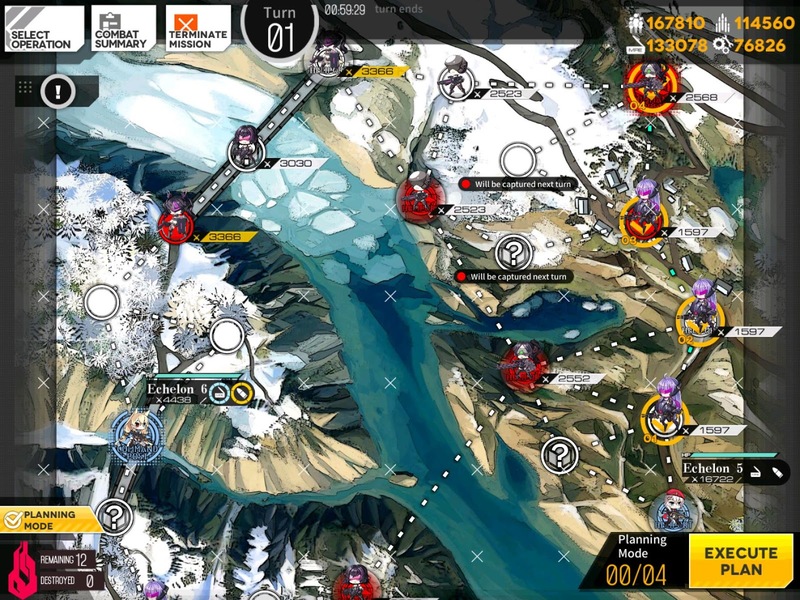 players in the community has recommended that going clockwise is easier due to taking on weaker units before taking on the stronger unit compared to counter-clockwise.Just like 5-4e, your last move should be to spawn a Dummy HG on helipad, swap with “Bus” echelon, and retreat both echelon to terminate mission to reset.